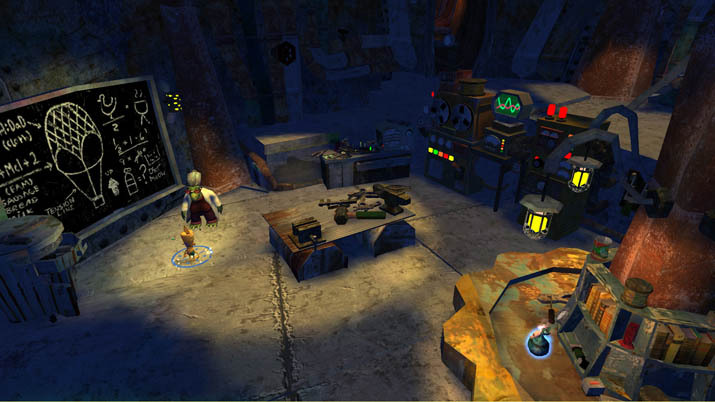 Voodoo Vince: Remastered makes its way to the Steam platform with a remastered version while featuring the same gameplay. The story begins in a voodoo shop; Kosmo the Inscrutable and his henchmen take the owner, Madam Charmaine, away, and you’re left to control a surprisingly perceptive, animated voodoo doll. The doll’s unexpected personality adds to the humor, particularly at one part where you meet this scientist-type character who professes no one else can understand his theory, and Vince (the doll) handily deconstructs the concept. The title takes itself lightly as a whole: at the start screen, you’ll find a box of zombie flakes and a jar of dog hearts and kitten tails; in the docks area, once you find a way to pass this giant pig, the voodoo doll comments that it didn’t drop any money — not much of a piggy bank, it would seem. Some of the humor is dark, sure, but nothing is over-the-top or shocking. After dying, you’re treated with irreverent sound bites, such as, “The grim reaper says, ‘Hi’”; and, "The afterlife was really short." When you enter a new area, you see a quick overview of it from finish to start so you’ll have an idea of your goal. 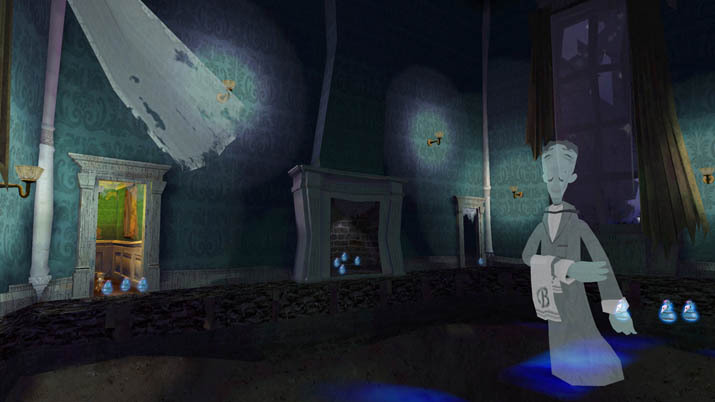 The levels seem to always have the same general setting and are small (one I rushed through, midway through the game or so, in just about ten minutes), but they do not feel all that bland; each area is someplace new to explore, navigate, and conquer, with some goal to complete to progress to the next area. Madam Charmaine tells you this goal, but not how to achieve it. But, walking up to a certain key part that’s crucial to completing this objective usually prompts Vince to give you some hint. Charmaine will also give details about what certain pick-ups do, for example, there are spherical objects that drop from fallen enemies, some of which refill your health. You may find collectibles along the way, from power icons that unlock new voodoo powers to these blue bags of zombie dust which expand your health meter for every one-hundred you obtain. Collecting all the skull pages make a power skull appear and subsequently fly once you activate it. Catching this expands your bead storage capacity, which is used to activate a voodoo power. There are a multitude of these voodoo powers, and when you press the button to activate one, it is random, but all the powers prove useful when enemies surround you — plus, they’re comical. The first boss isn’t necessarily hard (easier than the second boss, that reptilian thing), but at least stressful. Without careful focus and caution, you may find yourself having to redo the encounter. But, even here, Charmaine gives you some hints, making fairly straightforward what it is that you must do. This way, you can focus on exploration and the task at hand. After this point, you’ll pretty much be at some small hub, with two different areas to explore at the present moment until you complete these and progress further in the story. One option, Roachfort: The Upper City, has some exquisitely precarious platforming aspects. Each step counts, and one misstep could spell quick death. A few times my eyes grew wide, and I felt a shiver at just how precarious some of these areas looked. But, not all of these are simply platforms and ledges that force you to be high above a bottomless pit: one, in particular, seemed more like the first level from Frogger. Remember how you had to cross a street and there were cars of various speeds traveling, after which you’d have to cross a river that featured logs and turtles? This section was nearly like that river portion, with flotsam floating as platforms. Other difficult parts are a sort of challenge, such as when Vince must collect shirts hanging on a line, or when he is flying a plane. Some parts of the tunnel you flight through when piloting this plane are grimly dim, and I had to strain to see where I was going. It didn’t help that touching something results in the plane exploding and you losing a life, but at least you don’t have to restart from the beginning. If you lose all your lives, you return to the start screen, and you may lose progress if you haven’t saved. I have not found a manual save option, so I just go from one area to the next to save. The graphics aren’t realistic, but this title doesn’t go in for visuals. Rather, the art style is aesthetically pleasing and fitting. Given the premise and theme, I’d say this direction worked quite well. Putting the video setting into windowed mode makes the screen go into a corner and it is harder to navigate the options to switch it back to fullscreen. Attempting to drag the application’s screen to the center, so that I may see the settings, proved futile. When I pressed the windows tab button, to bring up the toolbar, then back onto the application’s tab, it will sometimes become just a small horizontal strip; simply click on the tab on the toolbar once again to fix this. The camera in-game is manageable, but does act up on occasion. In one instance, the camera did a complete 180 on me, and I ended up walking into a pit and dying. And, when standing atop a ledge, you may be unable to angle it correctly to see what’s directly below you, but the hover ability (available at the start) helps immensely in these situations. Plus, you can enter into a first person view mode, which proves handy. 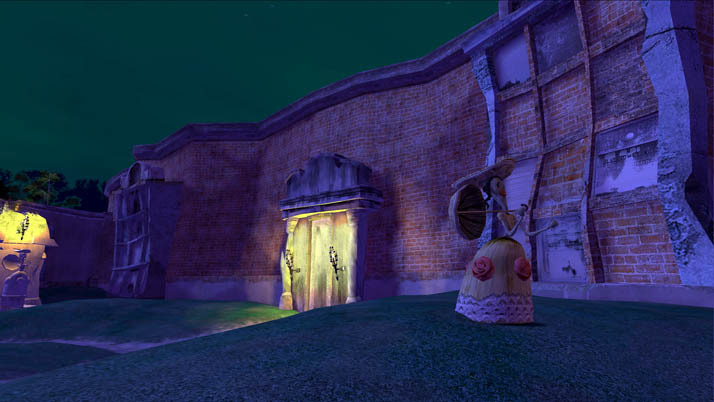 If you are a fan of platformers, you might want to pick up Voodoo Vince; between its rather unique spin on a theme and setting (setting aside whether or not it depicts the culture and religion of Vodoun, as people often spell it, accurately) and its dark, thematic humor, this is worth having. Camera issues are minor, and easy to manage, which is not always the case for a 3D platformer. This title is, however, a bit linear. Once you complete a section, it’s unlikely you’ll need to revisit, save to collect any missed collectibles or to refill your number of lives; nor do there seem to be any missable sections of an area that you can only reach with an ability you’ll unlock later. This is more of something which to be aware, and not necessarily a con.